All transactions are safe and secure with a reliable history in online purchasing behind each of our associates. Buy the G.I. Joe Costumes - Snake Eyes, Etc. to own G.I. Joe clothing and merchandise. 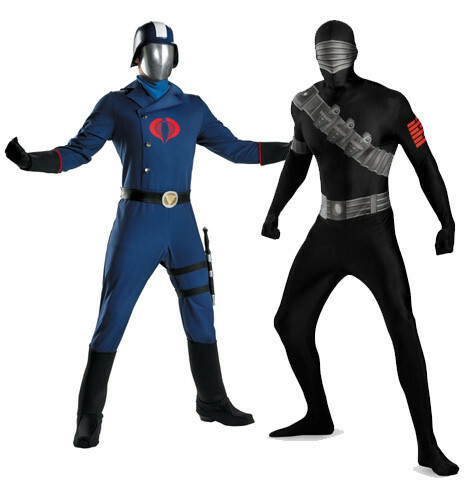 The cool Snake Eyes costume is perfect to wear overtop of your favorite G.I. Joe t-shirt for an intimidating warrior combination. Embody one of the most celebrated characters from the G.I. Joe cartoon, who joined Cobra in order to infiltrate the organization in an attempt to discover the individuals responsible for the death of his uncle. The officially licensed Snake Eyes G.I. Joe costume includes the jumpsuit, hood and visor. Upgrade your outfit to include the Snake Eyes gloves and the Snake Eyes sword that displays the Arashikage ninja clan tattoo symbol. Don't wait to bring your favorite figure to life. In addition to the G.I. Joe Costumes - Snake Eyes, Etc. above, browse the G.I. Joe Clothing Gallery for more apparel like men's and women's clothes, kids shirts or hoodies.